MADRID — Atletico Madrid coach Diego Simeone believes his side face a "pure night" of football when they take a 1-0 to Leicester City’s King Power for the second leg of their Champions League quarter-final. "We anticipate a fantastic football night. An English stadium, the fans close to the pich, it will be a pure night of football," Simeone said of the return leg on April 18. 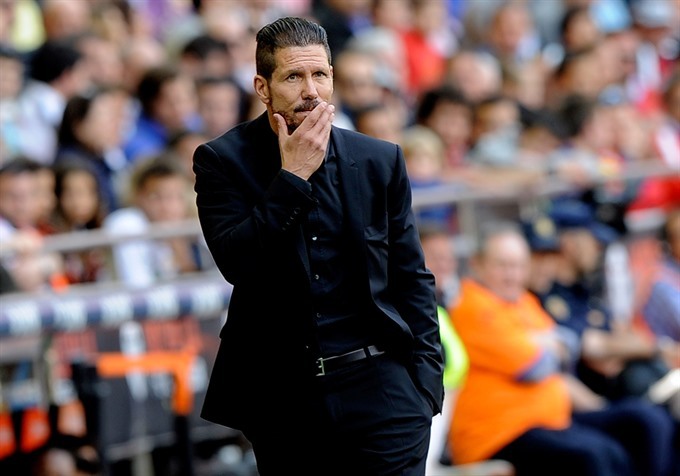 "He is a fabulous player," added Simeone. "He is a complete player, you don’t know what position he plays because he is all over the pitch. "He is still growing, he is playing very well at an important part of the season and has is assuming more responsiblity in the hierarchy of the team." "I think we were hard done by," said Shakespeare. "I think it is one of the major decisions in the game. It is a definite foul but it is outside the box." "We’re still alive, we want to stay (in the Champions League) but we know we still have a challenge ahead against a very, very good team," said Shakespeare. "We know it is still going to be a very difficult return match. "We have a very good home record at the King Power, our fans enjoy these Champions League nights. "We have to create more chances, we have to attack probably a bit more than we did tonight, but we are aware of what we need to do in the second leg." "It will be very difficult because we have to be more open and attack more," he added.